The Local Organising Committee for the 2019 Rugby Barbados World 7s (RBW7s) will host their third annual Gala Charity Event to assist the fight against breast cancer. The Gala will be held on Thursday 12th December at the Radisson Aquatica Resort Barbados, who are also offering special accommodation deals to RBW7s fans, and Tournament organisers are calling on Barbadians and visitors alike to contribute the minimum US$140/£100/Cdn$170/Bds$280 donation per person to support the event (less 10% for tables of 10). International guest speaker, noted ex-International Referee Derek Bevan is being flown in from the UK specially for the Gala Charity Event. The evening includes cocktails, a three-course dinner and a charity auction featuring Rugby memorabilia and fine jewellery. The Dress Code is “Elegantly Casual”. Proceeds will go towards helping Rotary to support the Stephen Alleyne Sport for Life Programme (also sponsored by the Sandy Lane Charitable Trust) which assists in educating our youth in life skills, literacy and numeracy, as well as sporting skills and leadership development. The programme is additionally endorsed by the Ministry of Culture, Sports and Youth, and the National Sports Council. 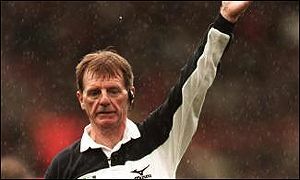 The organisers are delighted to welcome Derek Bevan, the renowned Welsh International Referee whose distinguished career has seen him in charge of 43 International games, which included a World Cup final, a semi-final and 11 others, as our guest speaker for this occasion. Contact Brian Stollmeyer brian.stollmeyer@gmail.com or George Nicholson gnicholson@adebbarbados.com to reserve your place.